Time is running out for tomato growers if they want a juicy harvest before Christmas. For the serious cook or tomato addict there is only one way to experience the “true” taste of tomatoes: grow your own! But time is running out. If you want ripe tomatoes by Christmas, don’t delay. Sow seeds now, plant out seedlings or look out for patio tomatoes that are available as young plants. Heirloom tomatoes are varieties originally grown by families or communities where the seed was handed down from generation to generation. Besides red, there are black, purple, yellow, green and striped varieties. Heirloom tomatoes are known for their intense and interesting flavours. Many varieties are now available in seed packets, with by far the largest selection being offered by RAW. These include Green Zebra (sweet, sharp flavour), Clear Pink (sweet and tangy Russian variety), San Marzano (a Roma tomato from Italy), Brandywine (beefsteak variety dating back to 1885) and Principe Borghese (Italian heirloom). Sow in trays or pots using germination, not seedling mix. Don’t let the soil dry out during germination. Feed with Margaret Roberts Organic Supercharger after germination. Transplant at about 15cm tall. Heinz to heirloom varieties. 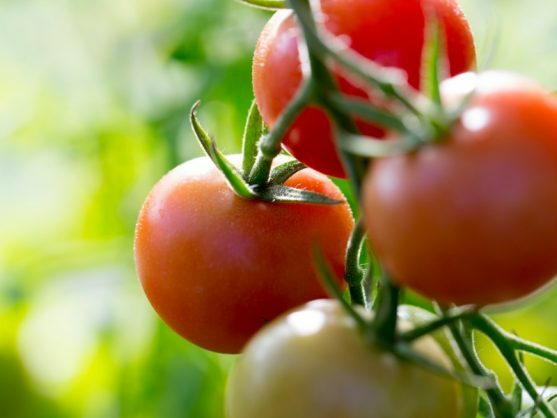 Look out for Sweet ‘n Neat (dwarf cherry tomato), Black Krim (dark-red Russian heirloom), Little Napoli (Roma tomato) and Tumbling Tom (cascading cherry tomato for hanging baskets). Prepare beds before buying the seedlings so they can be planted immediately. Tomatoes like fertile soil that drains well. Dig in plenty of compost and aerate the top layer by turning it over and breaking down clumps. Buy sturdy-looking seedlings with dark-green, healthy leaves. They should not be leggy or have pale green leaves. Water seedling trays well before planting out. Water with Margaret Roberts Organic Supercharger after planting. If you like the idea of growing tomatoes in pots, the Simply Delicious Patio Range has three new varieties that deliver lots of fruit on compact-growing plants. the same reason blueberries are blue and contain antioxidants. The vines should be staked and this encourages them to bear plenty of fruit. It is a quick-maturing salad tomato. Sunrise Sauce is a quick-maturing, orange Roma-type. It is a small, determinate hybrid that is good for small gardens or large containers. Its yields are high and the orange fruit is sweet and meaty. It can be eaten raw, but the best flavour is achieved through cooking. Makes an eye-catching orange salsa and sauce. Although the plants don’t need staking, they do benefit from some support or cages, which will result in a more concentrated harvest. A good tomato for preserving. Candyland Red has dark-red, sweet fruit which is smaller than the cherry tomato and ready to pop into your mouth straight from the garden. The plant is tidy and the clusters of fruit are formed on the outside of the plant, making them easier to harvest. Plants do best with morning sun, afternoon shade. Water daily and feed once a month with Margaret Roberts Organic Supercharger. Don’t place pots against hot walls; allow for plenty of air circulation. This reduces the chance of red spider and white fly.